Did Holder Just Deliver An Activation Signal for a Coup Against Trump? Attorney General Eric H. Holder Jr., delivers remarks following President Barack Obama’s statement announcing Holder’s departure, in the State Dining Room of the White House, Sept. 25, 2014. Attorney General Holder will remain at the Department of Justice until his post is filled. If you like body language, this photo has it all. This is clearly a departing employee who is willing to fall on his sword for his former boss. (Official White House Photo by Chuck Kennedy). If you are looking at this tweet for the first time, you are no doubt rubbing your eyes and doing a double take. Is this a case of Holder having too much to drink at 3AM and he should have been sleeping it off rather taking to twitter? Or, as some are now suggesting, is this cryptic message a trigger mechanism for something big that is about to be launched by this very mysterious message? Trouble follows former Attorney General wherever he goes. Aware and awake Americans are all too familiar with Holder’s scandalous path which should have landed him in a prison cell. More on that later in this article. 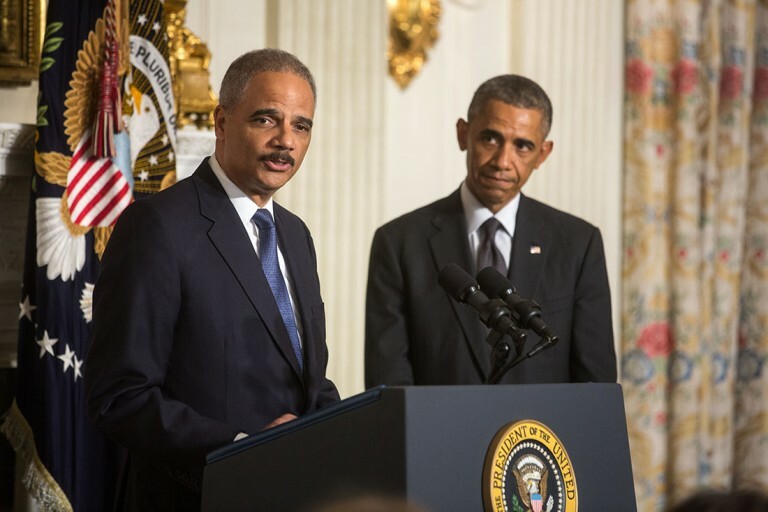 However, the pressing point in the present moment centers around the question of why was the former Attorney General, Eric Holder, who was let go by former President Obama after he put into motion Obama’s crazy gun confiscation scheme known as Fast and Furious, now issuing tweets telling the FBI and DOJ to be strong and “your actions and integrity will be unfairly questioned. Be prepared, be strong. Duty. Honor. Country”? Take this question and combine with another question, why did Holder agree to move to California, at the request of embattled California governor, Jerry Brown? Also, more on the answer to that question later, as well. What could FBI and DOJ officials do that would cause their actions integrity to be questioned? At face value, this clearly implies that at least some personnel at the DOJ/FBI are planning to engage in an action, a nefarious action, that Holder has first hand knowledge of, and this action falls into the realm of being unethical and illegal. If this was not true, why would Holder say that their integrity would be questioned? Is there anything in Holder’s past that predispose him to make a tweet that strongly suggests that elements of the DOJ/FBI will have their integrity questioned? There is no question that Holder’s background is rife with controversy and criminality and should be considered when evaluating this tweet. Holder’s role in Fast and Furious which was designed to illegally put guns in the hands of drug cartel members in order to prove that average Americans cannot be trusted with with guns and gun confiscation is an appropriate course of action, has to be considered in the context of this tweet. Many forget that Holder’s criminality and depraved indifference directly led to the death of Border Patrol Agent, Brian Terry, as he was gunned down by one of these guns Holder made available to the Cartels. As a result of Holder’s illegal actions in Fast and Furious, he was called before Congress. In the midst of the Congressional investigation, Holder became the first Attorney General to ever be held in contempt of Congress for refusing to answer questions. Unfortunately, Congress did not have the intestinal fortitude to put him away in a prison.cell where he belonged. Holder is serving as legal counsel for California to act in defense of Trump and his potential actions. Originally, his duties included facilitating California’s exit from the country through what has been called CALEXIT, which has since been shelved. From the beginning, Holder has been a subversive force when it comes to upholding the Constitution. His past actions clearly make him a person who is decidedly anti-American. In addition, Holder’s obvious connections to the Mexican Drug Cartels put a very different light on his present tweet. Clearly, Holder is noting that select officials of the DOJ and FBI will be called to perform actions that are illegal in which their integrity will be called into action for if the DOJ/FBI were to be acting legally and Constitutionally, there would be no reason for Holder to warn these people that their integrity will be questioned. Further, it does not take a rocket scientist to realize that Holder is directly messaging Deep State holdovers from the Obama administration within the DOJ and the FBI. It is also very plausible that Holder’s tweet is a trip switch for some kind of affirmative action from these officials. Holder’s past actions would indicate that he has clear connections with the drug cartels given his fast and furious associations. And if his associations include the drug cartels, they also include terrorists (eg Hamas, ISIS, etc.) because it is a well-known fact that the two groups are intimately intertwined (e.g. HSBC banking scandal). I have concluded that this message is a directive for assistance in upcoming coup against Trump and the people of the United States and Holder is seeking assistance of these agents targeted in the tweet. However, there is another element that must be considered with regard to this tweet. If this tweet has purpose and to believe otherwise, is naive, then we must consider Holder’s connection to the treasonous CALEXIT. He is clearly not loyal to the preservation to the United States. Further, I have reported, courtesy of a Paul Preston, from Agenda 21 Radio, that Preston’s embedded and inside sources have repeatedly reported that the fail safe position of an unsuccessful CALEXIT movement would be the use of drug cartels to randomly assassinate members of the public in order to force a crisis of government. I believe that Holder is at the center of an action related to an overall coup against the President nd that all of these elements will be brought to bear. At this point, please allow me to note something that on the surface would seem totally unrelated. It was widely reported, yesterday, that Hollywood types, such as Bill Maher, are shifting their approach away from advocating for the assassination of Donald Trump to an all-out civil war. In the context of what seems to happening in regard to Holder’s cryptic message, we must ask ourselves is the timing just a coincidence? Or are we witnessing the messages that will trigger unparalleled strife in this country with regard to its recent history? Readers will no doubt ask me in the comments section, what do I think the end game is? To answer that question, I have to put myself in the mindset of the Deep State. If I were them, I would initiate an action that would require a martial law response from Trump. I think this is what Holder is triggering with his tweet. Once martial law is in effect, this would provide the perfect climate from which the Deep State could emerge from the shadows, eliminate Trump, and take over a nation that is already under martial law. This would be the perfect climate to initiate a coup and the implementation of a total police state. At least that is what I would do in the same situation given these same circumstances. Regardless of how conspiratorial one allows themselves to become over this tweet, there is no question that it would be a huge mistake for all of us to not seriously debate the meaning of this tweet and it potentially far-reaching implications. How do you interpret this? Please leave your comment. Here is a video synopsis for easy sharing.